From April 13, 2013 “Day in Photos” at VOAnews.com comes this surreal yet delightful image of a multitude of kites doing what they do best: fly! Lots of great colors and mandala-like shapes to go around. Even the lampposts have mandala-like orbs on them as well. Very cool. 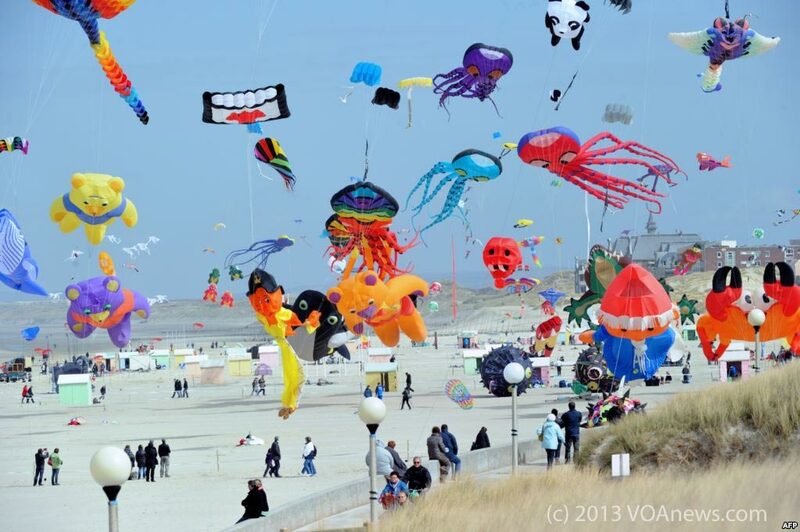 Almost 700,000 spectators come to the vast Berck-sur-Mer beach to contemplate the world’s best kite-makers’ new creations. Open to everyone, there is entertainment for all ages. Your little ones can learn how to make and fly kites in a safe environment. Marine life, astonishing flying creatures, giant octopuses, even memorable characters from your childhood undulate across the sky. A colourful festival where you have your feet in the sand and your head in the sky.